Ghost Bikes are placed worldwide as silent reminders of a cyclist killed by a motorist. 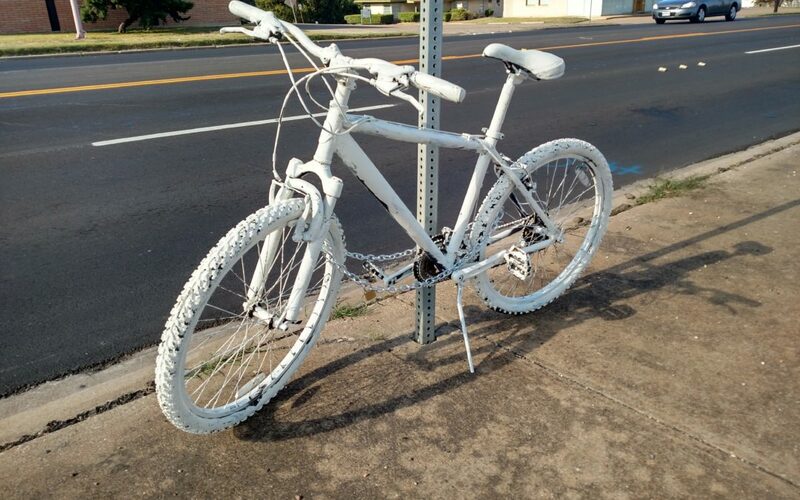 A Ghost Bike was placed this past Saturday at the site where David Grotberg, a 19-year-old Baylor University honors student, was killed by a hit and run driver. David had a scholarship to Baylor and his family reported that they could not afford a car for him. He worked in a bike shop back home in Minnesota and was comfortable riding his bike for groceries and to do all his errands. He was a very bright student and active in music and social activities on campus. His future looked strong and positive and those around him were sure that he would go far. The first rule of driving is to control the vehicle – the full repsonsibility rests with the SUV driver. When I learned of this senseless death, just 10 blocks from my home, I felt immediate shock and then anger. I felt anger at the driver for not controlling their vehicle, and moreover, for not stopping to render aid. I will not blame the car or truck – they are inanimate objects. Aside from an Act of God, such as a tree toppling into the roadway, there are very few ‘accidents’. The driver who killed David has the full responsibility – David was operating his bicycle in a legal manner on a public road and using powerful bike lights. He was wearing a bike helmet. This was no accident – it’s a clear case of manslaughter by SUV. Let us hope the police catch the driver before he or she hurts or kills someone else. So what good is a Ghost Bike? It can’t bring the dead person back, it won’t stop the ache in the mother’s heart, it can’t give David’s brothers and sisters their beloved older sibling. The Ghost Bike bears witness. It serves as both a reminder to those who have lost a brother cyclist, and passing motorists. The Ghost Bike stands in silent vigil to the fact that driving a car warrants full attention and responsible behavior. According to the National Safety Council, in 2015, 33,800 people were killed on US roads with another 4.4 million injured severely enough to need medical treatment. Of these about 818 were cyclists. The number of deaths for both auto occupants and cyclists rose substantially from the previous year. Alcohol, speed and distracted driving are the main contributing factors to fatal incidents. We do not yet know if these were factors in David’s death. Franklin Avenue, where David and his girlfriend were riding, is known for speeding drivers. The City of Waco does not have a traffic enforcement division, and business owners on Franklin tell me that speed enforcement is spotty at best. Franklin is not a street I like to ride on for sure. But it presents a clear and direct route between Baylor and the movie theater that David and his girlfriend were returning from, so they rode on it. In geometry we learn that a straight line is the shortest distance between two points – and this is what Franklin Ave affords the traveler. David was acting rationally. I said earlier that I am feeling angry. Angry with the driver for snuffing out a bright light amongst us, but also for his/her cowardly flight from the scene. I am also upset that we, the cycling community, do not do more to help new cyclists in Waco. We could help by offering orientation to students on safe ways to ride a bike and the best streets to use. David probably did not know that both Austin Avenue and Clay Avenue parallel Franklin but are much more bicycle friendly. Why have we not created and published a Bike Map with recommended streets and paths? I have been working for two years on local bicycle advocacy – trying to develop a system of complete bike routes that will improve safety and increase the desirability of cycling. Our bike club group have had many meetings with City planners and engineers and we are seeing some progress – but its awfully slow. I’m upset with myself that maybe I could do more – recruit more allies or press decision makers more effectively. In general, anger does the most harm to the person who feels it. Angers leads to bad decisions. It can destroy families and communities. Therefore, anger is generally regarded as a negative emotion and I have tried to eliminate it from my life. However, focused properly, anger can be used for motivation to do good. Creating a Ghost Bike reminds us of the need to never give up. I will use David’s death to seek in my heart for compassion and forgiveness for the driver – it must be a terrible knowledge this person holds inside them now. I am going to keep riding my bike responsibly and fearlessly. Fear is the evil twin of anger and it too has no place in my heart. World peace begins in the heart of each of us, in our families and our community. I am using this Ghost Bike to be strong, unafraid and to never give up. Doing this honors David, his family, and all my fellow cyclists. Very well stated. The ghost bike means so much to our family. David would have been pleased. I agree with my cousin Diane’s (Grotberg) sentiments; thank you for your very well stated article. Thanks for your determined efforts to make cycling safer in Waco. Never give up. This is a very powerful reminder to a young life taken needlessly. Thank you for doing this and thank you for your powerful words. Cycling is so healthy and healthy for the environment, we must work to make it safer.